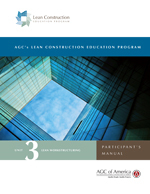 Lean Unit 5: Lean Supply Chain and Assembly is a one-day, instructor-led course that Unit 5: Lean Supply Chain and Assembly that introduces the lean strategies and tools used to deliver materials, equipment and prefabricated assemblies to the jobsite in a manner that facilitates flow. The four-session course challenges class participants to map the supply chain ? looking to minimize waste and maximize value ? in a collaborative fashion with all project team members, including suppliers and vendors.